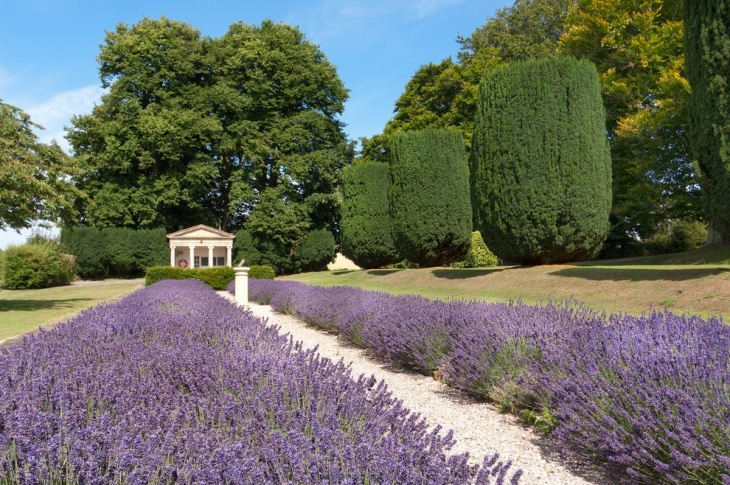 If lavender is your favorite flower, then you should take a good look at the gardens in this series. Lavender is a beautiful shrub that not only produces pretty and scented flowers, it is also known as a good source of food (syrup, sugar and candy), medicine (lavender oil). Drien petals are also used to prevent moths. 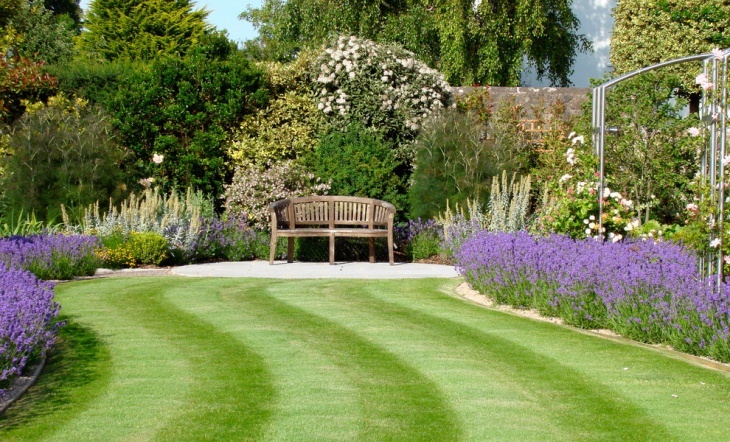 You can use some of the best lavender garden ideas even if you only have a townhouse garden. 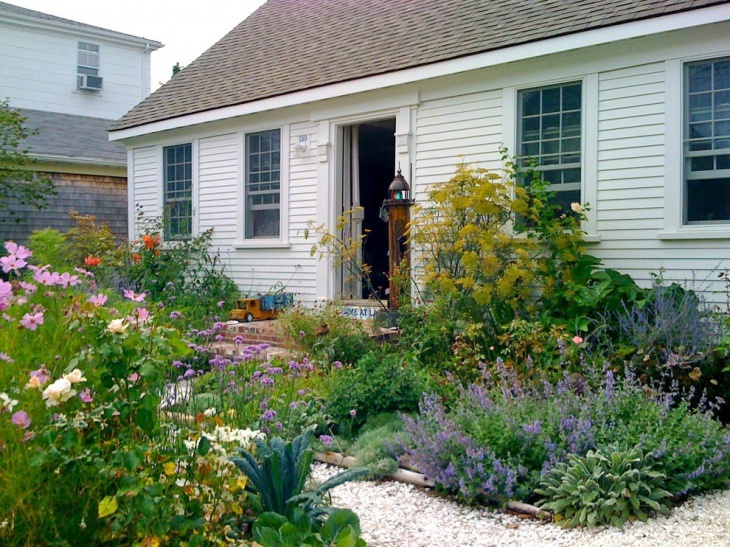 This front yard garden is filled with plants that can withstand even the hottest weather. 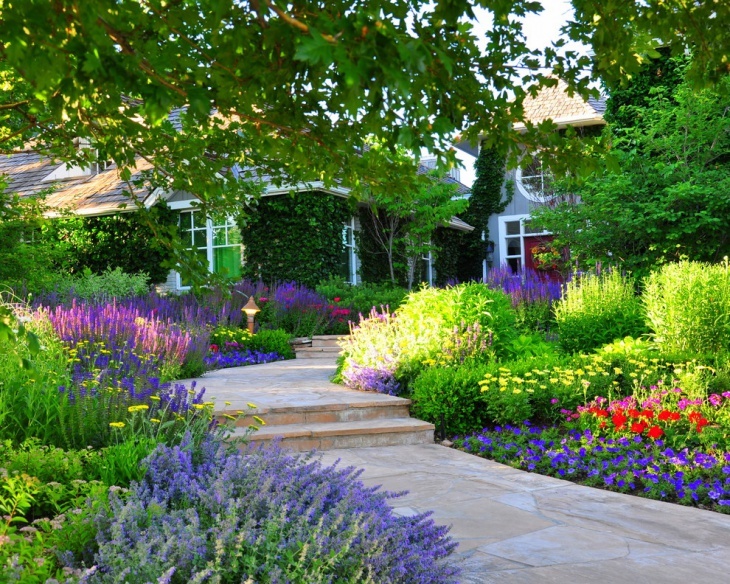 It means that your garden stay lush and beautiful all-year-round. 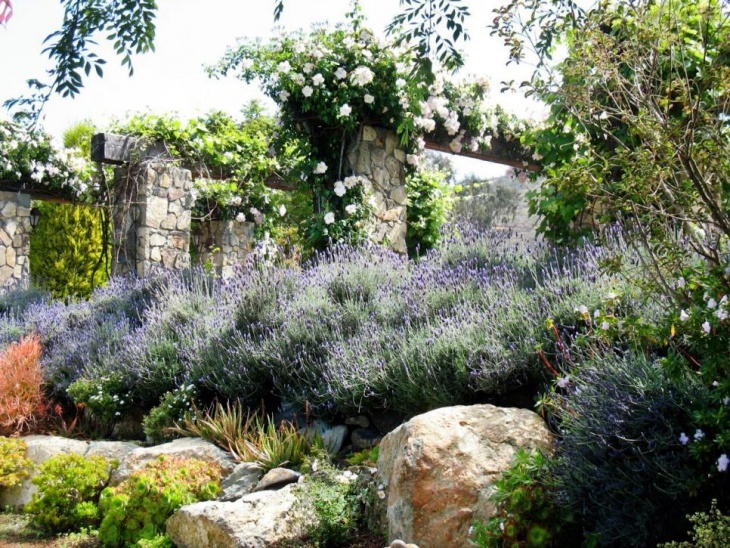 The purple magic is brought by the randomly arranged large Spanish Lavender bushes. With the addition of other colorful shurbs and grasses (like boxwood, Libertia, Festuca glauca and Anagozanthus, the result is a perfect rustic garden. This estate entrance is designed to be the perfect welcoming road for guests. 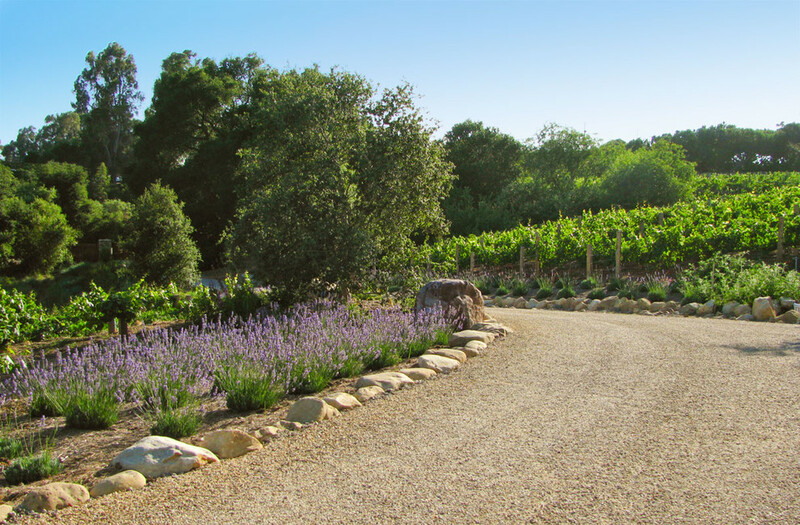 The vineyard can be seen on the right side and the left side of the road is lined with beautiful lavender. To add some green to the sea of lavender, Live Oak trees are scattered around. 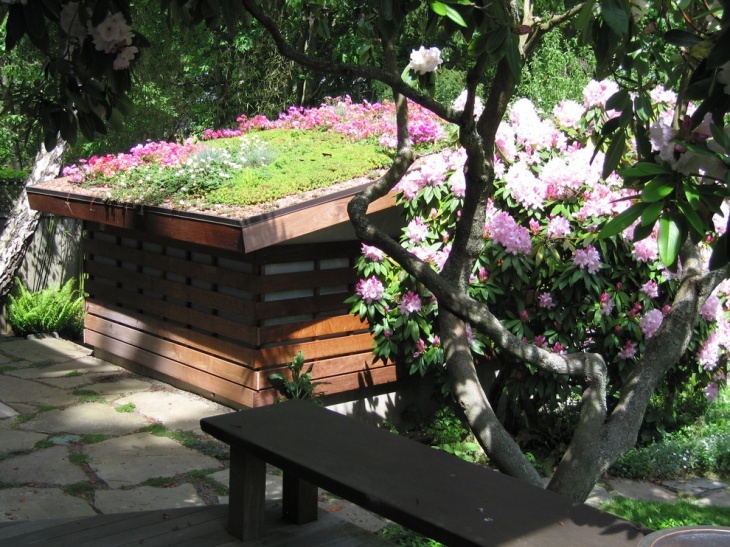 If you are looking for a shed roof garden idea, this one should be a good help. This low roof is transformed into a beautiful small garden of plants with different colorful flowers (like Deer fern, Elijah blue, Beach strawberry, Lewisia, and Oregon stonecrop. 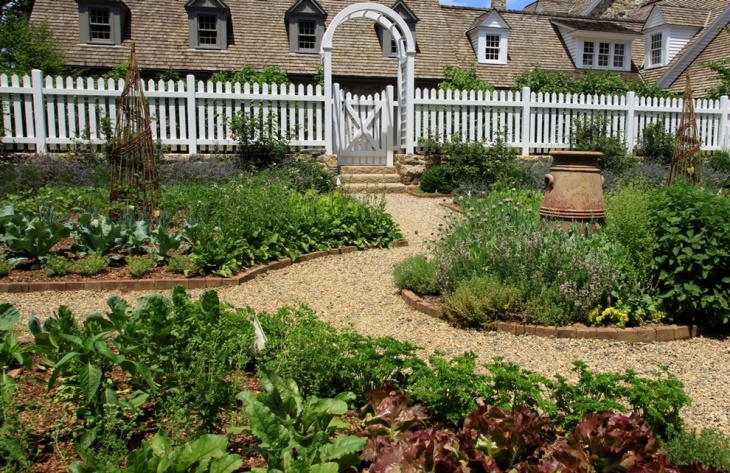 This edible garden is designed with vegetables and herbs, making it a good source of fresh greens throughout the year. 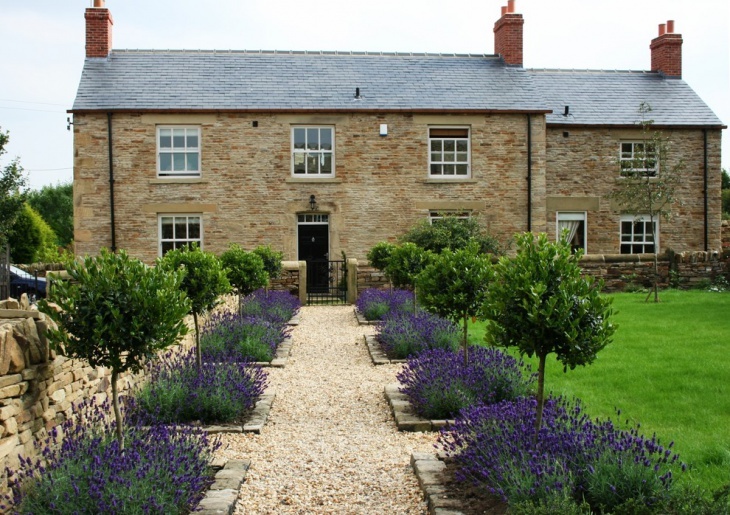 The beauty of this cottage is enhanced by the design of this magnificent lavender and succulent garden. 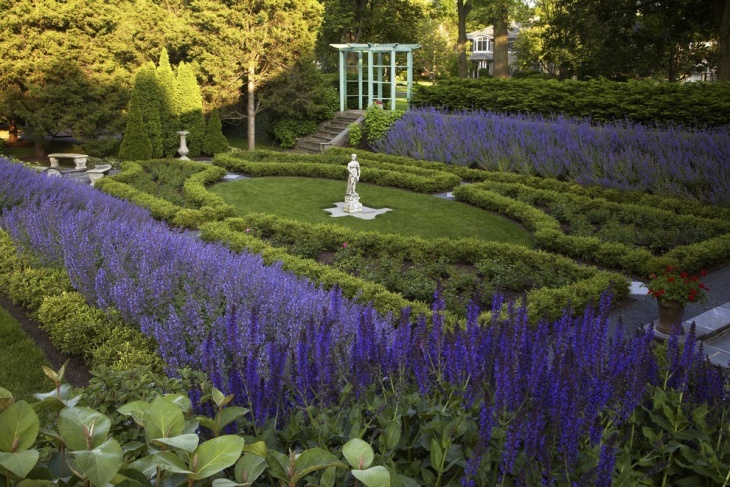 Aside from the beautiful lavender shurbs, this garden is also filled with other beauties like catmint, Russian sage, rose bush, cosmos, tiger lilies, and kale. 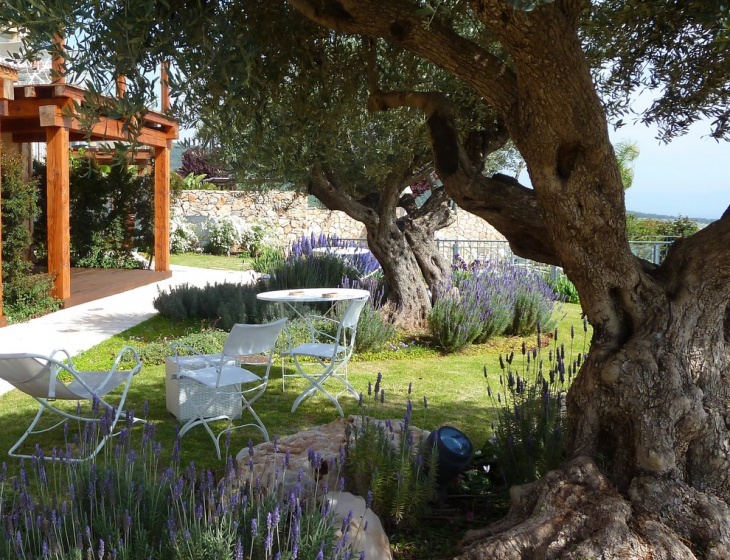 This Mediterranean garden is naturally designed with Meditarranean lavenders. The way the plants are arranged was just perfect as they are able to grow and bloom to create a purple painted look on the walkway. 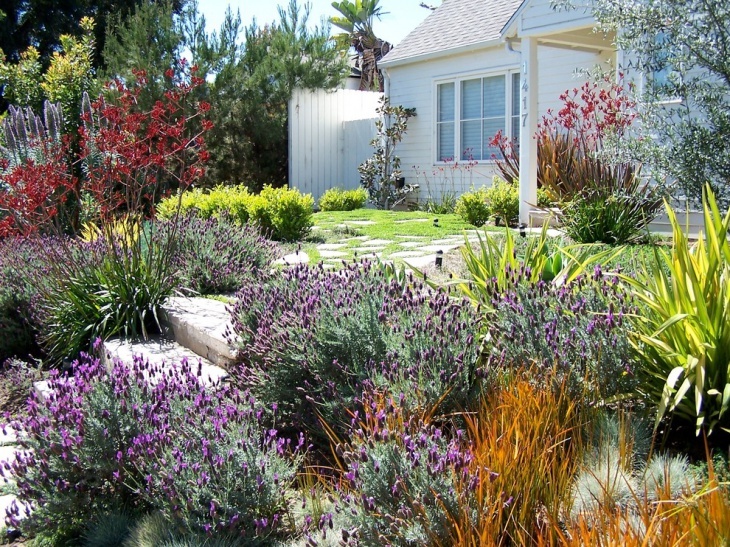 The house at the end of the lavender pathwalk stands out among the surrounding greens. 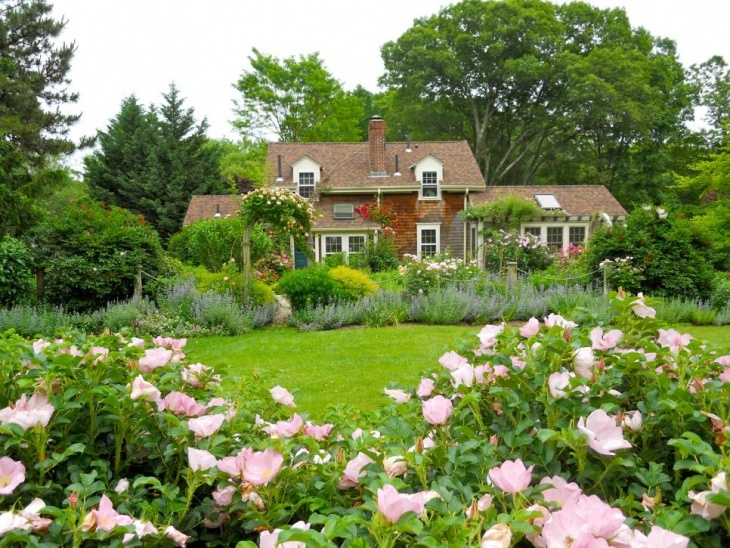 This formal garden has a beautiful combination of professionally designed lawn, perfectly arranged lavender shrubs and randomly planted rose bushes and other plants and trees in the back part. The wooden bench provides a rustic relaxing appeal to the whole set up. 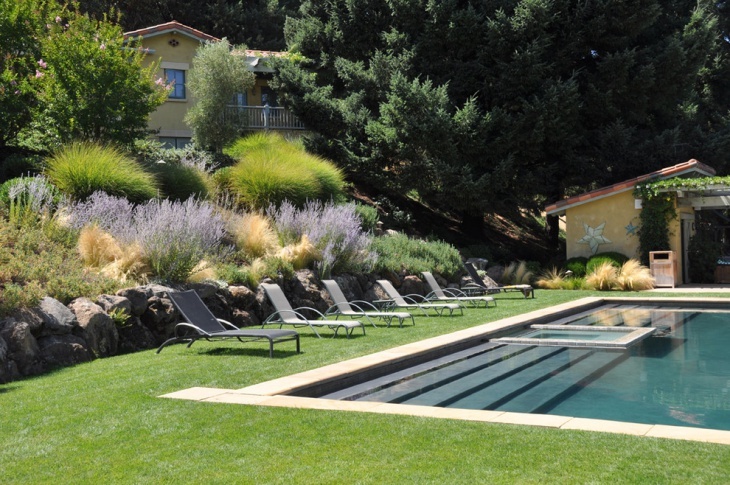 This garden looks very unique as usually a pool is not set within a short distance from the ground and the plants. But the idea here is to create a nice balance between the modernity of the pool and the wild beauty of the bush. 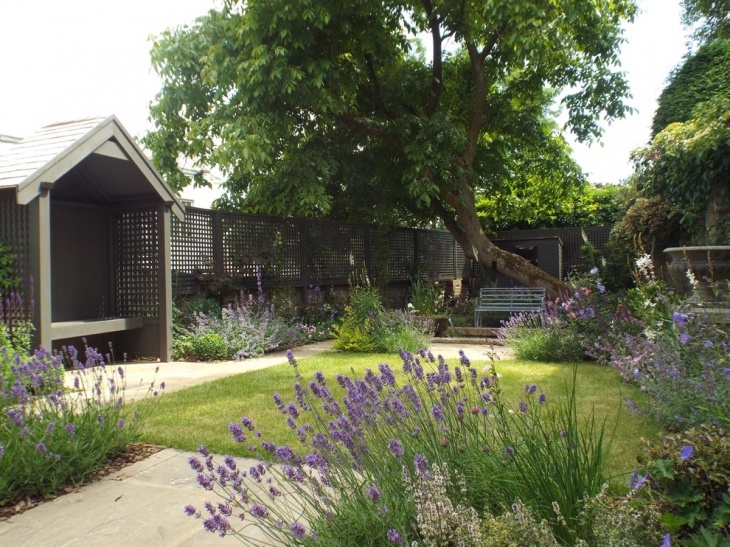 The elevated garden is planted with lavenders, Miscanthus sinensis and other pretty greens. 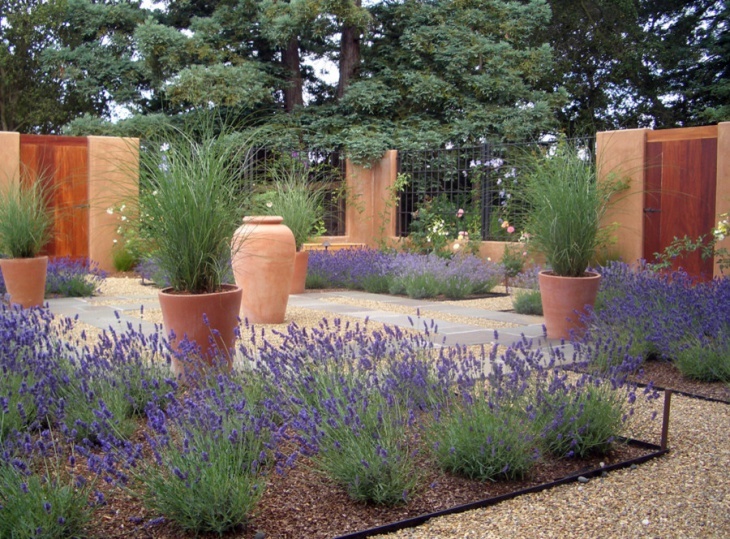 Whether you are planning for a formal, cottage, small or rock garden, using lavender as the main plant is always a good idea. Why so? Because the beauty of lavender is eternal and they can be used for other purposes (medicinal and for sweets). 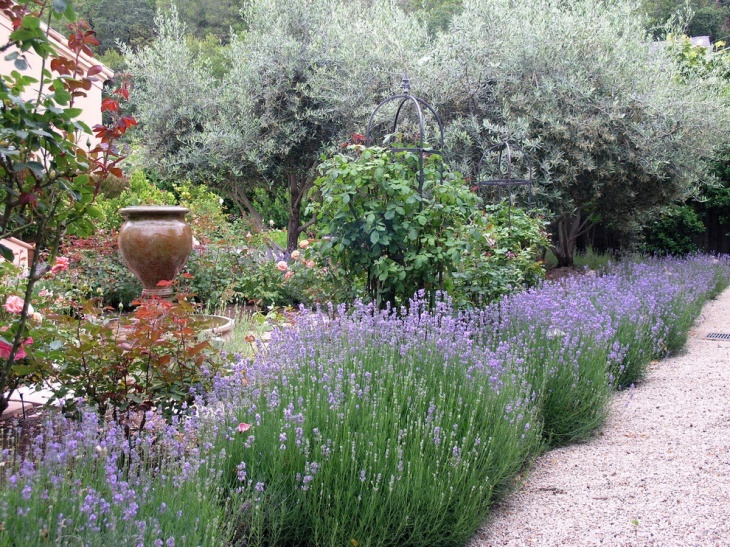 Additionally, lavenders can be mixed with roses bushes and lilies.